Meet our family of instructors. Master Treger is a 6th degree black belt with over 40 years of both martial arts and teaching experience. His life-long love of Tae Kwon Do, Shudokan and Aikido began simply because he wanted a sport to fit in the off seasons for football and lacrosse. He began his instruction under Master Dale Tompkins where he received a solid foundation in Tang Soo Do, but it was the late Grand Master Ki Whang Kim who nurtured his competitive spirit and started him on a lifetime martial arts journey. With a style that combines both the traditional and practical sides of the martial arts, master Treger is able to engage both youth and adult students to make their experience within the studio both educational and fun. Master Treger is a certified AAU coach, National Administrator for the USSA Martial Arts Program, Board of Directors for the United States Karate Do Association and 2016 Master's Hall of Fame inductee. Master Treger holds a Bachelor of Science in Criminal Justice and works for the State of Michigan Department of Human Services. Master Elizabeth Treger started Karate to have an activity to do with her son. Now, over 20 years later, she is a 5th degree black belt and specializes in instructing school-aged students. Starting under Master Marcella Byrd, Master Treger has deep knowledge in the foundation of Tae Kwon Do. Having studied under as fierce a fighting competitor as Master Byrd, Master Treger still competes and consistently places in the top three in her division. She has over 13 years of pre-school and elementary teaching experience and enjoys sharing her love of the martial arts with her students. Master Treger holds a Masters of Science in Mental Health Counseling. Master Heather Allen is a 5th degree black belt who began studying Tae Kwon Do in 1992 under Grand Master Eugene Humesky. In early 2007 she reinvigorated her enthusiasm for martial arts when she began training under Master Treger. Master Allen's focus is on the fundamentals of martial arts with an emphasis on physical fitness. Master Allen holds an MBA from Harvard University. Instructor John D'Amico's love of martial arts began when his friend began Tae Kwon Do. John thought it sounded like an interesting, fun, and beneficial activity, so he gave it a try. Little did he know how firmly this interest would take root and grow. Now a 4th degree black belt, John is a many-time AAU State Champion in both Tae Kwon Do and Shotokan Karate, proficient in Brazilian Ju Jitsu, has numerous first place tournament finishes, and proudly became one of TSMA's first black belt students. Fighting is John's passion and he is currently leading a special fighting class for the tournament team members. Stephanie Haase is a 4th degree black belt who has been training with us for just over six years. She started martial arts as a way to get back in shape and spend time with her kids. Not long after beginning this journey she discovered she had a real passion for not only training, but coaching as well. Always eager to learn something new and share it with the class, Stephanie is excited to bring another of her passions, yoga, to TSMA. Sarah began training at the age of five and is a multiple AAU Karate and Tae Kwon Do medalist. 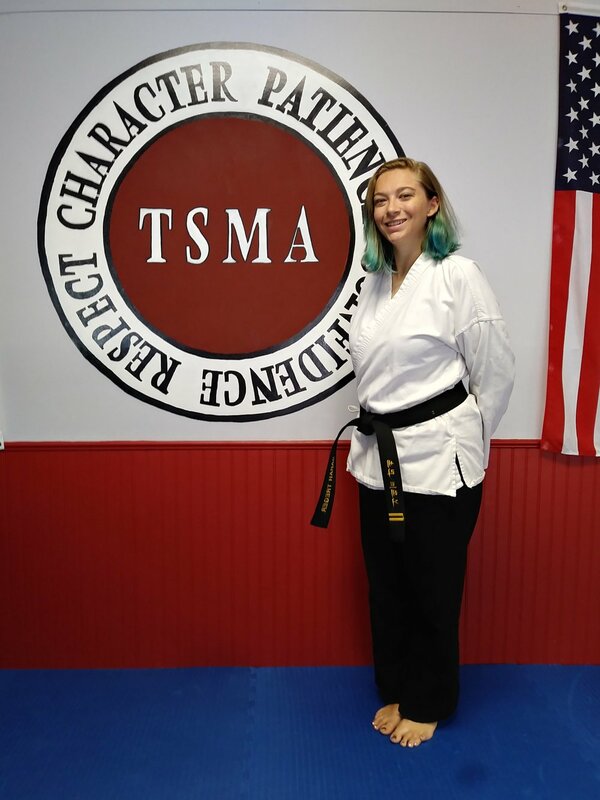 She is one of TSMA's top black belt instructors, assisting with both the Little Kickers and Mixed Belt Classes. She is the Demo Team Leader and teaches the karate program at Oakland Yards. Sarah is currently a student at Western Michigan University majoring in Social Work. Vivienne has been a student since 2012 and recently tested for her 2nd degree Black Belt. Vivienne is a three year veteran on TSMA Tournament Team, a member of the USA/NKF and the USKA organization. Vivienne won her first USSSA Karate world championship at the age of 11. She is passionate about karate and is eager to share her knowledge with new students. Eddie MacDougall joined TSMA when he was eight years old. He received his black belt on December 5, 2015. Eddie has been on the Demo and the Competition team. He has earned many medals at competitions. He also enjoys helping at Ninja camp in the summer. Steven is our Head Brazilian Jiu Jitsu Instructor. He has trained in BJJ for over 15 years and received his black belt in 2013 from Rigan Machado and Ryan Fiorenzi. He enjoys instructing and specializes in the technical aspect of the BJJ. Additionally he holds a 5th dan black belt in American Karate from Master Jeff Duncan. Tom Maciak is one of our Brazilian Jiu Jitsu Instructors. Tom has been training BJJ since 2008 and is currently a Brown Belt under Steven Keckan. Tom received his BJJ instructor certification in 2010 under Professor Marcio Corletta, which emphasizes technical fundamentals and self-defense aspects of BJJ. Tom started marital arts in 1989 in Yoshinkan Aikido and has earned a black belt, plus a brown belt (1 kyu) in Budokan Kendo. He also competed in collegiate fencing (foil), and completed Michael Janich’s Martial Blade Concepts System. He has been a Defensive Tactics Instructor, teaching weapons retention, handcuffing, hand to hand and PPCT.